Protizyme Specialized Designed Protein is a premium pharmaceutical grade engineered protein that is ideal for pre and post bariatric patients. It is designed to increase protein absorption and that is a very important feature to bariatric patients. In scientific terms, the secret lies within the unique manufacturing process of Protizyme, which differentiates from all other regular proteins in the marketplace. 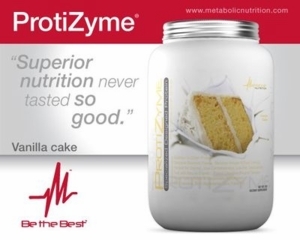 Protizymes 10x ultra-microfiltered process preserves the essential protein-peptide structure which delivers greater concentrations of amino acids, glutamine and BCAAs. Each gram of protein in Protizyme is coated with only the most potent digestive enzymes dramatically increasing digestion and absorption, therefore eliminating gas and bloating. What does this mean to you? It means you can absorb more protein per meal. More protein absorption means increased protein synthesis, thus faster results than other regular proteins!" Ingredients: A proprietary blend of Ultra 10x-microfiltered enzymatically hi-absorption whey protein isolate and whey protein concentrate (containing highest levels of bio-active immunoglobulins. Beta-lactoglobulin (55%-65%). Alpha-lactalabumin (18%-25%), Immunoglobulin (9%-12%), Bovine Serum Albumin (6%-10%), lactoferrin (1%-1.5%), T.A.G. (Trans-Alanyl Glutamine). Maximum Potency Digestive Enzyme Complex (comprising of Amylase, Protease, Cellulase, Galactohydrolase, lactase, Lipase, Betaine, pepsin, and Papain), Vitamin Mineral Blend (consisting of Ascorbic Acid, Beta Carotene, Biotin, d-Calcium Pantothenate, Folic Acid, Niacinamide, Pyridoxine Hydrochloride, Riboflavin, Thiamine Mononitrate, Vitamin A Palmitate, Cyanocobalamin, Cholecalciferol, Tocopheryl, Magnesium Oxide, Manganese Sulfate, Molybdenum, Dipotassium & Dicalcium Phosphate, Potassium Iodide, Selenium, Zinc Oxide), Low-Fat Cocoa powder, Lecithin, Xanthan Gum, Guar Gum, Natural and Artificial Flavors, Sucralose.